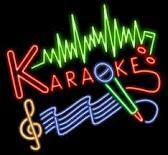 “LIVE” KARAOKE every MONDAY evening starting at 9 P.M. in our upstairs Bar & Lounge. Just so you know, Sam was never a big fan of yodelin’ or hog callin’, but any song by Willie is just fine with him. Begins at 8 PM. 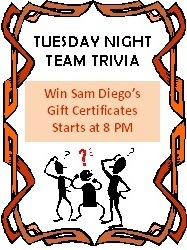 Bring your best buds to help you WIN Sam Diego’s Gift Certificates. $50 First Prize, $25 Second Prize.